Welcome back! 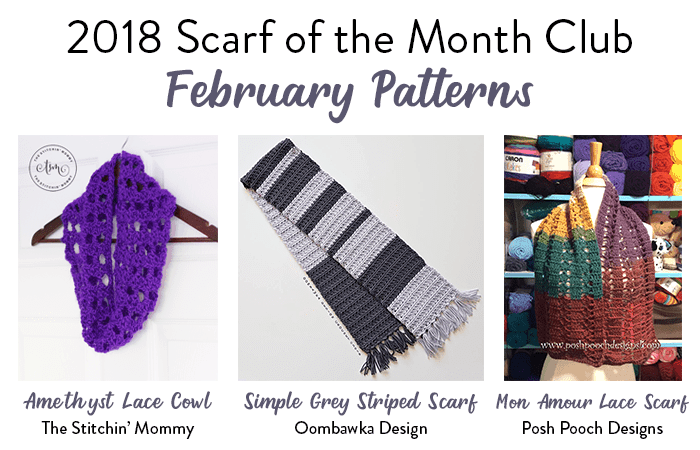 Today we release our Scarf of the Month Club Free Patterns for February. 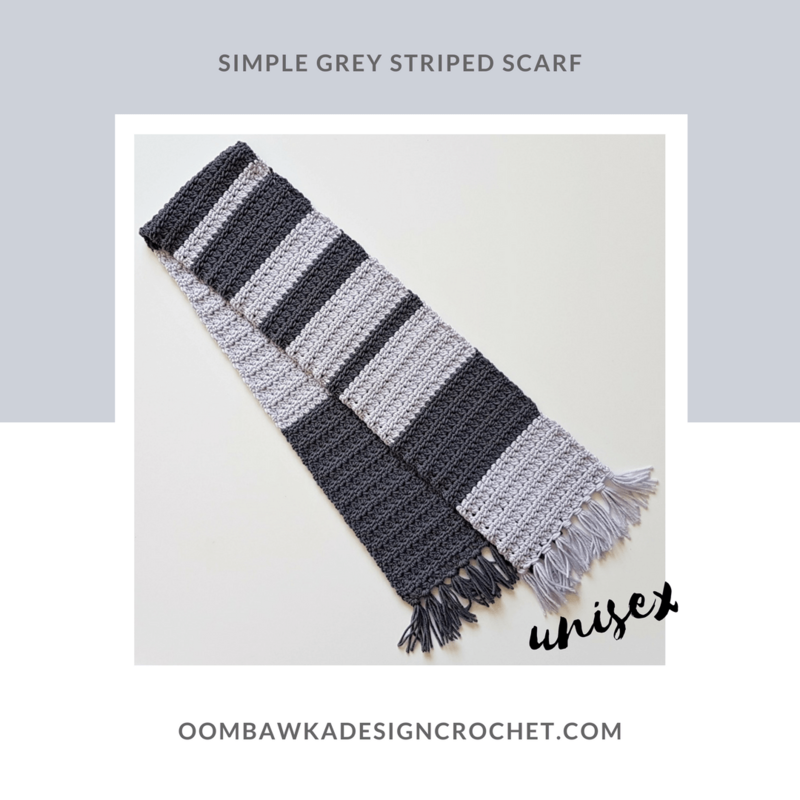 This month I chose to design a super simple striped scarf. You can crochet this classy scarf in a single evening. 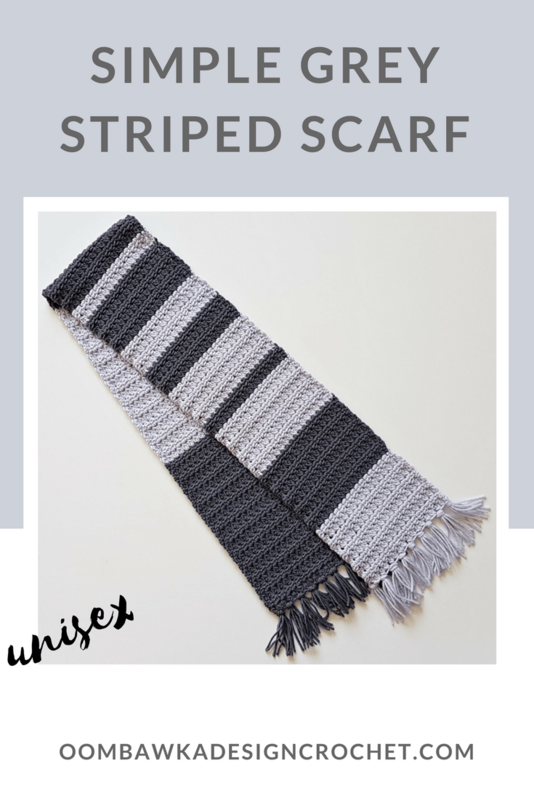 The striped scarf is perfectly suited for both men and women. Or, you can easily crochet this in a single solid color to emphasize the texture of the stitch pattern. Here are your February Scarf of the Month Club Scarves! 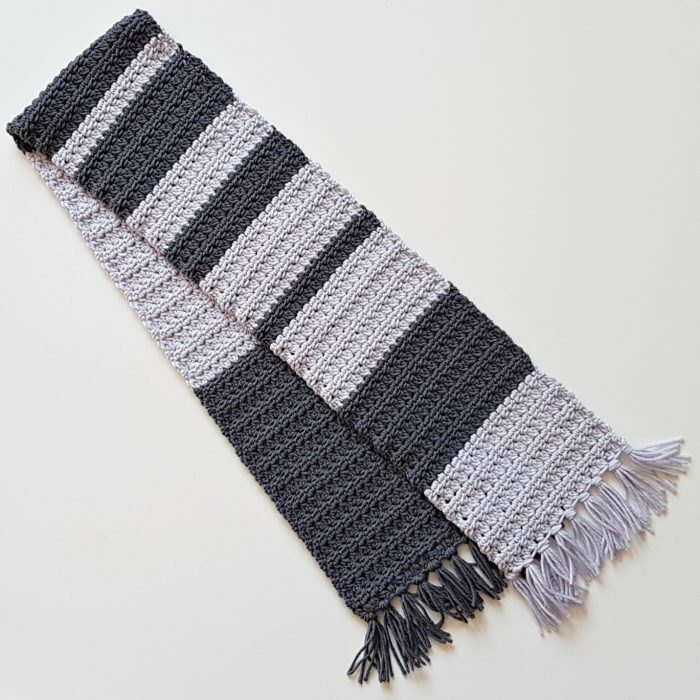 The Simple Grey Striped Scarf can be crocheted in any light weight  yarn. My completed scarf took 278 yards of yarn. The scarf can be made longer and wider easily as this stitch pattern can be worked with any number or stitches. I love the ridged look created by the stitch pattern and the simple texture of the cluster stitches. If you are making it for someone who does not like fringe, simply omit the fringe and let the scarf hang or whip stitch the ends together to create a infinity scarf or cowl. Cluster (cl): yarn over the hook, insert your hook into the specified st, yarn over and pull up 1 loop (you have 3 loops on the hook). Yarn over and pull through 2 loops on your hook (you have 2 loops on your hook). Yarn over and insert your hook into the same st. Yarn over and pull up 1 loop (you have 4 loops on your hook). Yarn over and pull through all 4 loops to complete the cluster. To make this easier I used a 5 mm (H) hook for my initial chain row. You can instead just use your 4 mm (G) hook but be sure to make those initial chains super loose or else it will be shorter than the rows that follow. The cluster (cl) stitch is described in the Special Stitches section above. Do not work into the initial ch 3. You may crochet this in one solid color instead. For those of you who would like to add the fringe to the ends of your scarf, this is how I created mine. Repeat these instructions twice. Once for each color of yarn you used in the scarf. Step 1: I took a credit card (or piece of cardboard cut to 3.5 inches long) and I wrapped my remaining yarn around it, lengthwise 45 times. Step 2: Cut along one end of the yarn only. This will create 45 pieces of yarn each measuring 7 inches in length. Step 3: Separate your yarn strands into bundles of 5 and then follow this process to add the fringe to the ends of your scarf. I placed all five strands on at once (rather than one strand at a time). I added mine on each edge of the scarf and then between every 2 clusters across. See image below for an example. I chose to attach my fringe to the same color scarf edge but you can mix it up using both on one side or mixed together – whatever you like the look of best! Or simply leave the fringe off completely! I love the abstract look of this scarf. Makes a great gift for my friends back in the Midwest! I purchased the recommended yarn. However I ran out of it before this scarf was finished. I would recommend increasing the yardage needed.